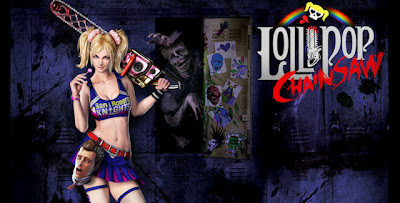 Suda 51’s Lollipop chainsaw is a zombie chopping score attack game, its comic book style and cheerleader protagonist makes it an interesting and unique play. Juliet Starling is a cheerleader at San Romero High and is your typical blonde bimbo stereotype… but she has a secret. She is a chainsaw wielding zombie hunter. In fact her whole family are zombie hunters with unique skills which you get to witness as you progress through the game. It’s the day of Juliet’s 18th birthday and she is late for school, but once she gets there, she discovers it has been overrun by zombies. Her boyfriend Nick gets bitten and Juliet saves him by cutting off his head and performing a “magic ritual” to keep him alive. She then keeps him as a talking accessory and attaches him to her belt. The whole story is ridiculous and crazy, but what do you expect from a Suda game? The story is an integral part of game progression so it never feels tacked on. Juliet’s birthday ties in perfectly with receiving new weapons as gifts from her family and Nick serves well as a helper character. The story never slacks on the crazy either, the game knows that it’s stupid and ridiculous and stays that way, never expecting you to take it seriously. It’s not an amazing story but it’s well written and suits the style of the game, the characters are great and the dialogue is perfectly delivered by the voice actors. The game focuses on earning a high score by clearing stages quickly and executing combos. Once a stage is completed in story mode, a score attack mode is unlocked where you can compete on a leaderboard. The score attack nature of this game makes it very linear with little to explore, but that doesn’t mean there isn’t anything to find. Killing zombies earns you gold medals and killing them in special ways earns you platinum medals both of which can be spent in the store. Stores are scattered throughout the stages and sell combos, upgrades, songs and outfits. Unfortunately the stages are quite long, too long for this kind of game. It wouldn’t be a problem if they were split up in sub sections or if the checkpoints were clearer. This can make the game feel a little laborious at times as you expect a score attack to be fast paced. For a game as ridiculous as this, it does feature a wide variety of features and combos to rack up the points. Her cheerleading abilities give her the prowess to pull off some pretty ridiculous yet cool and flashy (in every sense of the word) moves, and that’s what will get you the big score. There is a wide variety of zombies with varying strengths and you are occasionally forced to approach certain enemies with different tactics. You are also occasionally tasked with saving students from zombies for a big bonus; fail to save them and they turn into a powerful foe. Executing combos and just killing the zombies in general feels satisfying, but the best parts of the game is hitting R2 when the star bar is full which unleashes all kinds of zombie death to the song “Oh Mickey”. LPC isn’t all about chainsaw slicing as the game is riddled with different quick time events for varying actions. One such action is putting Nick’s head on a decapitated zombie, a QTE is used to move him to a desired location to help Juliet progress. Occasionally Juliet will be in danger and would need to dodge, a QTE is used which seems pointless considering there is a dodge mechanic already in place. Continuing away from the chainsaw, Juliet is given a mod by her older sister called the chainsaw blaster. Juliet’s chainsaw turns into a huge shotgun when you aim with L2, this has its uses and doesn’t take away from the melee combat but it comes with its problems too. It features an auto targeting system which more often than not, targets a zombie behind you rather than the one in front of you. The gameplay is slightly broken up by mini games and while they are fun, they don’t add anything but length to the stages, and the buggy targeting of the chainsaw blaster ruins one of them. At the end of each stage there is a boss fight, as expected they are weird and sometimes gross but fun to play. However the story boasts of progressing difficulty in the bosses, but this doesn't seem to be the case. Even with minor faults, the gameplay is extremely fun, the story is short but there is endless replay value as it is not possible to gain all the combos and upgrades in one playthrough. LPC has a cell shaded comic book style to it with lots of bright colours, sparkles and rainbows. This might not be for everyone but it definitely suits Juliet and the games silly nature. It’s such a refreshing break from all the brown and grey that this generation is cursed with. There is even a subtle comic book “dot” effect over the gameplay, but this might be guilty of increasing the loading times. Suda games tend to have long loading times but this really takes the biscuit, granted the game wasn’t installed but it shouldn’t take that long. Each boss and their respective environment has their own unique style representing a high school stereotype such as punk, hippie and metal, the only exemption is the final boss who, for spoilers sake I won't mention. The transition from stage area to boss battle is smooth as you are never plucked from one area to another, providing consistent visuals within each level. The music needs a special mention as it is the perfect accompaniment to this game, it’s just awesome. 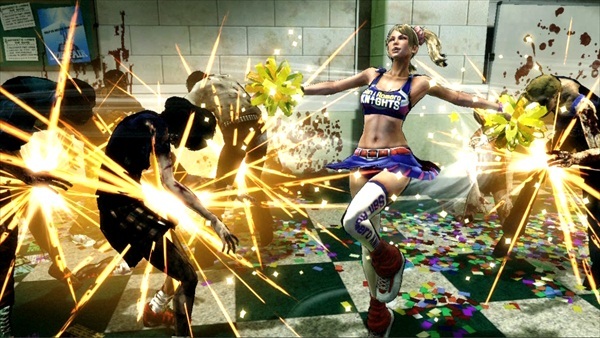 A mix of punk, rock, pop and old school sounds a little strange on paper, but it’s all kinds of right when chopping zombies in a cheerleading outfit with a chainsaw, that has a phone inside it (one of tamer things in the game). The game is reinforced with stellar voice acting from Tara Strong (Harley Quinn, Batman) as Juliet and Michael Rosenbaum (Lex Luthor, Smallville) as Nick. Fortunately Tara Strong's Juliet doesn't make you want to rip your hair out like her Harley Quinn does. Lollipop Chainsaw is fun, hilarious and addictive. The game never pretends to be something it’s not and reminds you how games can be just mindless fun. It is extremely well thought out and executed and at a bargain price at launch, it’s a steal.